Upload your data, whether that be an excel, JSON or XML file. 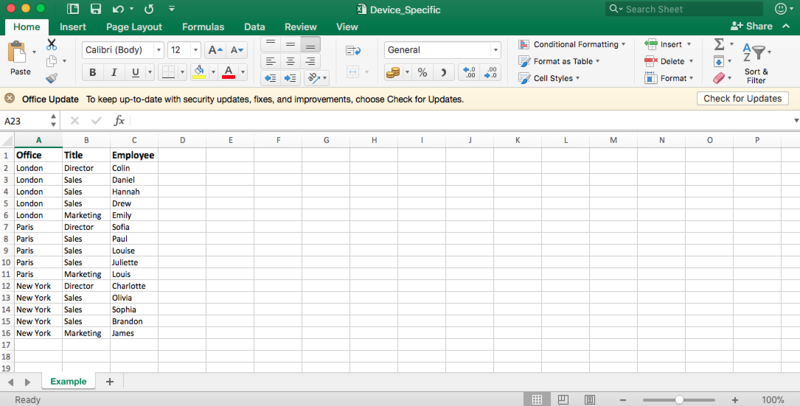 We are using an excel spreadsheet as an example below. Before adding your source, make sure the 'Use as item ID' option is selected and configured. The column selected for this option needs to be the column that we want to use to differentiate the data. For our example, it will be the 'Office' column. So we want the London device to only show the data that has 'London' in the 'Office' column. Go to the 'Devices' section to edit your device(s). Click the pencil icon to the right of the device you want to edit, scroll down to the 'Dynamic Data' option. Will show multiple items of data and gives you the option to 'Search' or 'Manually select items'. 'Search' - Allows you to add queries so this device only shows specific data. 'Manually select items' - Will list all of your sources data, you then select the 'Item title' of the data you want this device to show. Will show no device specific data meaning it will display as it is built using the dynamic data plugin in your layout. For our example, we want to show 'Multiple items' that all have 'London' as the data in the 'Office' column. Which we can do by searching and adding the query below. Click 'Save Device' in the top right hand corner to save this setting. Build your layout and add your data using the dynamic data plugin. 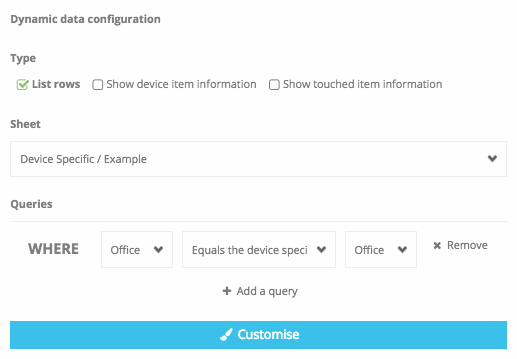 Before we add and customise our data, we have to add a query so it will only show device specific data. In our example, we want to show data that is only equal to the value in the column we specified when we were configuring our device. So we want to show only the data that has 'London' in the 'Office' column. Once your layout has been set up, you can preview this layout on any of your devices to make sure the device specific data is set up correctly. Simply preview the layout and then select your device from the drop down menu, this will then preview this layout using the settings configured on this specified device.